The following twelve attributes are portals which will take you to an experience of yourself that you have likely never experienced before. Read each one with your eyes, but feel each one with your heart. Do not try to make sense of them for real knowledge is beyond the mind. Simply be open to an experience of the Divine! Begin with Courage and focus on each attribute as you relax and meditate. Slowly move around the wheel and see the bigger picture and feel the connection to all there is. It’s not the courage of this world you are seeking, but the real world, created by God. Only divine patience offers immediate results. Is it the wisdom of the world you seek, or of God? You are not here to believe anything but to KNOW that you are One with real joy. Everything lies within …and for this you can have Perfect Compassion. The Joy you seek now does not depend upon the movements of this world. Your gratitude for your meaningless error will bring the Clarity you have lacked till now, and everything will truly make sense again. I ask only that you understand who you are. You will not to be able to accept your role of power until then. It is not the depth of this world we are seeking, but of the world beyond your imagination. GIVE EVERYTHING TO EVERYTHING and you will remember what you are and why you are here. God’s Love, depends on nothing, and so it is unconditional. The Emissary Wheel works very simply. Start by just looking at the wheel and relax your mind; let the wheel spin and just let go. Continue to relax without losing concentration. The wheel will be one big blur. Do this for a few minutes and see where your mind goes. You should be feeling lighter and maybe seeing lights or colors. Soft meditation music is OK, but otherwise simply do this in silence. If you feel so guided, ask a question and see what comes up as the answer. Pay attention to every detail and simply soak it all in. Are there any issues in your life? If so think about it (separately if there is more than one) and ask for the best path to take concerning this issue. After you are done it is a good idea to take a few notes and/or to blog a bit about your thoughts. 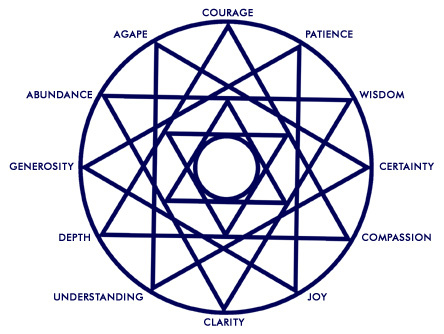 The purpose of the wheel is to guide you beyond your “self” to a feeling of oneness -The Divine Self who you truly are! After working with this wheel and the attributes for a while you will understand that there are many dimensions of existence beyond the one we experience everyday. I wish you Divine Peace on your journey of Love.